Cannes, the world’s most prestigious film festival, announced its selections earlier today, including the Official Competition (which competes for the top prize, the Palme d’Or), the Un Certain Regard undercard, and a handful of special, midnight, and out-of-competition screenings. The Official Competition lineup has its share of exciting titles: Spike Lee’s Jason Blum and Jordan Peele-produced Blackkklansman (formerly Black Klansman), based on the strange-but-true story of a black police officer who successfully posed as a white supremacist in the 1970s; Le Livre D’Image, the latest from the gnomic Franco-Swiss film icon Jean-Luc Godard, whose classic Pierrot Le Fou is featured on this year’s festival poster; Burning, the first film by the great South Korean writer-director Lee Chang-dong since Poetry; David Robert Mitchell’s It Follows follow-up Under The Silver Lake; new movies from Jia Zhangke, Jafar Panahi, Hirokazu Koreeda, Alice Rohrwacher, Matteo Garrone, Ida director Pawel Pawlikowski, and the embattled Russian theater director Kirill Serebrennikov. Asghar Farhadi’s Spanish-language Everybody Knows will be the opening night film. To a cynical Cannes-watcher, it looks an awful lot like some movies may have been promoted into Official Competition at the last minute. But only time—and the announcement of the lineup for Director’s Fortnight, a parallel festival that sometimes serves as a home for official selection refugees and pariahs—will tell. 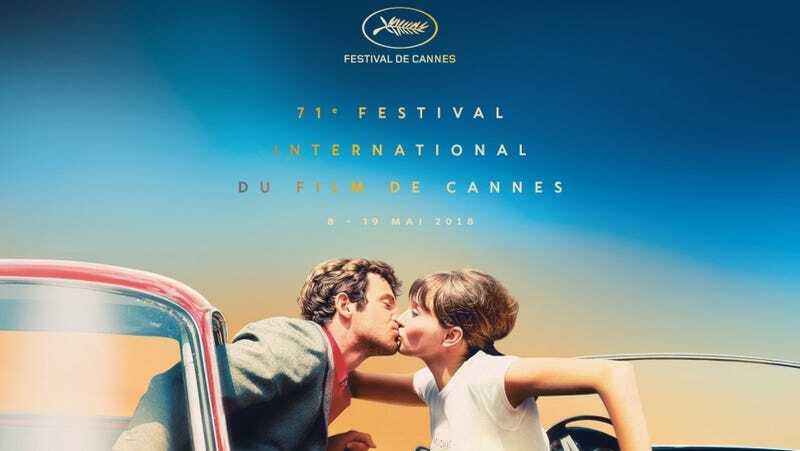 While Cannes is known to add competition titles at the last moment, the current absentee list is long, as the likes of Mike Leigh, Terrence Malick, Olivier Assayas, Mia Hansen-Løve, Lars Von Trier, Harmony Korine, Brian De Palma, Luca Guadagnino, and Paolo Sorrentino are all known to have wrapped their latest films. The missing title that seems to be on everyone’s lips is Claire Denis’ English-language sci-fi film High Life, long presumed as a contender for the Official Competition. But then again, Denis, one of France’s preeminent film artists, hasn’t had a movie compete for Palme d’Or since her debut, Chocolat, way back in 1988. The Cannes Film Festival will be held May 9-19. The A.V. Club will, as always, be there.